Despite NSW looking far superior at half-time, the ghosts of Maroons past spooked the Blues – while Queensland did just enough to ensure the series goes to a decider at Suncorp Stadium where the home side will be serious favourites to win. Here are the Queensland ratings for Game 2 of the 2017 Origin series. See how the Blues rates in Game 2. Great positional work and a good effort not to lose his cool despite James Maloney’s shennanigans. His continual ability to catch it on the full makes it seem like he has practiced those with Mitchell Pearce all year long. A couple of dropped balls but overall a solid Maroons debut. Managed to stay inside the stripe for Queensland’s first try, although plenty of NSW fans thought they were due a square up for the dodgy call against Hayne all those years ago. Despite a poor read leading to a NSW try, it was an OK defensive effort for a man known for his attack. Despite plenty of doubters and a penchant to crab across field, Boyd showed that he can hold his own anywhere in the backline – although centre is clearly not his best position. Boyd got lucky more than once when taking out a Blues attacker off the ball. 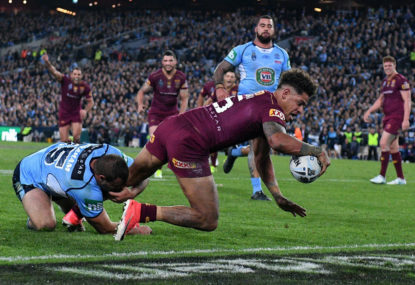 Roarers slammed me for not rating Gagai highly enough after the Maroons were towelled up by New South Wales in the first game of the series. They were right then and I dare say they’re right now. Gagai was probably the best cane toad on the park in Game 1, and not far from it in Game 2. Two crucial tries and some good carries despite being put over the sideline earlier in the game. Not his best game in Maroon, but the one-armed man came up with the crucial play at the end – kicking the conversion from close to the sideline around two metres in from where he missed the shot in the 2015 decider. If it really is his last series, Queensland – and rugby league as a whole – will well and truly miss this man. Cronk rarely has a bad game, with his kicking and passing game generally perfect even if his line breaks and try assists are few. Another one from the ‘Queensland are really gonna miss this man’ brigade. What is it with Queensland and redheads? The Firey one showed that he belongs at this level. Too old, too slow? Smith answered his critics from the first match, getting through a Smith-load of defence and feeding the ball to Josh Maguire for the Maroons’ second try. His pass for Gagai’s second effort was also understatedly brilliant. Pure Smith. Did OK during the softening up period, but wasn’t around where the game truly mattered. Queensland’s late heroics and the worst 40 minutes of Blues football this year shouldn’t overshadow the fact that Queensland’s forwards were outplayed. Cooper was solid, not spectacular. Gillett was guilty of trying to do too much, but got through plenty of work in his time on the pitch. Did he have spiders all over him in the lead-up to Gagai’s first try? NSW seemed to think so. Knows how to throw a crucial flick pass, doesn’t he? Morgan didn’t have the chance to do a lot but came through when it mattered, setting up Gagai’s last-minute try like 2015 all over again. One of the few Queenslanders to have played better last game around, but still did enough to get picked for Game 3. Hess didn’t have the barnstorming game that maybe he would’ve liked, but there are zero doubts that he belongs at this level. A few poor reads in defence, but Glasby should have done enough to earn his second cap in three weeks’ time. In a close game, the Maroons’ experience was enough to topple the Blues despite the home side’s excellent late defensive effort. Roarers, how did you rate the banana benders’ efforts?